"how the sustainable fashion space should focus on representation, visibility and inclusivity". 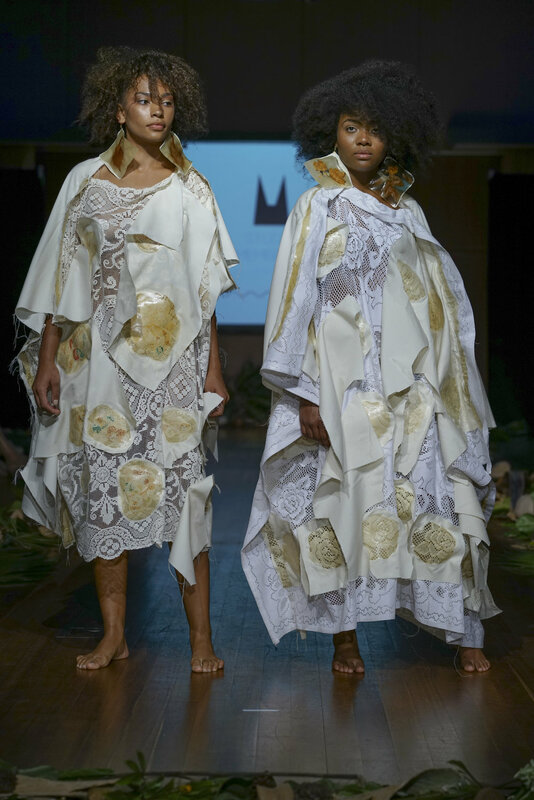 Label Betty Spoke on the Eco Fashion Week Australia runway in Fremantle, Perth. **please note, this is a transcript of a talk presented at the Disposable Planet seminar for Eco Fashion Week Australia. Presented at The University of Notre Dame in Fremantle and in Port Douglas on the topic of how the sustainable fashion space should focus on: representation, inclusivity and visibility. Before I get started I’d like to I would like to acknowledge the traditional custodians of the land on which we meet today and pay my respects to the Elders past and present. I extend my respect to the Aboriginal or Torres Strait Islander people who are present today. For those of you who I haven’t had the pleasure of meeting just yet, my name is Nat and I’m an eco fashion stylist from Sydney as well as the editor + founder of ‘tommie magazine’ an online platform for creative Women with a conscience’. A digital and real life community where we celebrate and showcase different voices in the context of slow style, conscious and sustainable living. Our work revolves around community, collaboration, consciousness and creativity. I started this platform for many reasons, but one of the main reasons was to elevate the voice of Women in the fashion space and showcase and celebrate all creative Women in their respective fields. As a young stylist working in the fashion industry, I often found that amongst most creative teams I worked with, I seemed to be the only Woman of colour with a mixed multi-cultural background. The commercial and mainstream fashion narrative that I worked in was always aimed at a white, western audience that advertised and relied on ongoing, relentless consumerism. The way in which fashion was being communicated seemed to be moving away from art and ancestral tradition to focus on capitalism. And each year I worked on fashion campaigns, not only were the clothes becoming more homogenous, but so were the Women being represented, too. The things that make fashion, and clothing so special to me seemed to be getting lost in the constant noise of media: Where was the individuality? Where was the pattern and colour? Where was the celebration of personal style and where were the Women that not only make up this beautiful country we live in, but our world as a whole? I felt frustrated that in an age where we focus and rely so much on the visual – the way in which we were interpreting the world was through a specific lens, portraying only one kind of Woman in media and advertising. To be clear, my issue with this wasn’t that this type of Woman was being represented; it was that all other Women were being left out of the conversation. Fashion is such a powerful tool in communicating ideas, politics, stories, social activism and global affairs – so if we are only telling one story how can we relate and identify with fashion? Or more importantly, in this environmental climate we are currently in, how do we all care about fashion if our media is only communicating these messages to a certain audience? In the sustainable fashion space we don’t often see the relationship between representation in media and sustainability. But the two are inextricably linked. When we think about sustainability some of the first things we think about are responsible textile sourcing, where our clothes are made and who made them? We know that the global fashion industry (which includes clothing, textiles, footwear +luxury goods) is worth an estimated $3 trillion – ahead of technology + tele-communications. The 2018 Global Slavery Index created by the Walk Free Foundation just released a report declaring that 40.3 million modern day individuals are enslaved – 71% being Women and girls. The garment industry is rated #2 out of the top 5 industries contributing to this. These statistics effect us are, as this world we live in is shared – not marginalised. And when we have 71% of females enslaved, fashion automatically becomes a gendered issue, a feminist issue. So representation is key to changing the systems in which the foundations of fashion have been built. To date – minorities and marginalised communities haven’t had equal opportunity to access fashion as communicators, interpreters and artists – people of colour are usually apart of the conversation behind the scenes as garment makers and factory workers. Not front and centre in positions of power and influence as models, stylists’, buyers, magazine editors, writers, ambassadors and spokespeople. The fashion industry has been built on the oppression of black and brown Women – an institutionalised form of racism adopted from our colonial past. Our fashion supply chains today in developing nations mimic that of 150 years ago – in that they supply cheap, disposable clothing to the West and elite classes of society, much like colonised nations who provided cheap coffee, sugar, fruit and chocolate to the Western world. If true sustainability is to exist in the context of fashion, we need to move away from this model of over production and over over consumption and focus on reducing and reusing and Women of colour need to take the stage as ambassadors and spokespeople to communicate what is happening behind closed doors. Even in the sustainable fashion space, where ethics plays a big part in changing the landscape – the industry is still dominated by white Women. The communities most affected by our sustainable industry decisions are black and brown communities, yet they are not afforded the right to take part in the decision making process. It is the privileged, resourced and elite groups who dictate the climate of fashion – now and for the future. When we’re referring to the current climate of sustainable fashion and bringing the topic of visibility to media, we’re faced with the over saturation at the moment of words like diversity - now is the time to acknowledge how powerful language is in communicating messages. I think we need to consider the fact that the term diversity in its very nature can be quite tokenistic. I think we need to consider the fact that the term diversity in its very nature can be quite tokenistic. Brands and marketing teams are using this word to promote inclusivity – and whilst we’re seeing more advertising campaigns, runways and editorials with different Women represented, how transparent are brands being about diversity behind the scenes and is this diversity holistic rather than tokenistic. As this idea of representation is filtrating the mainstream into traditional media, we see more brands casting Women of colour, from varying multi cultural backgrounds, varying ages, with different skin colour, hair texture, body shapes, sexual orientation, gender identity, abelism and so we need to develop a sensibility as consumers on what true and authentic representation looks like. If we have brands including Women of colour in media, yet not in important decision-making positions, then have we actually made real progress forward? When we have varied Women in front of the cameras, but not behind the scenes in the business of fashion, we’re still perpetuating this Western ideology of consumption and capitalism through the green washing of our marketing, over true sustainability and integration of culture and heritage. This is when the concept of transparency and traceability come into effect not only with regard to supply chians, but also when we as consumers want to investigate the true mission and philosophy of a brands commitment to inclusivity. Much like we would research the inner workings of a brands commitment to sustainable textiles, responsible sourcing, ethical production and manufacturing – we can also research and vote with our dollar to support female founders, CEO’s and managing directors of fashion businesses. If this information isn’t readily available on brand websites and in about sections, email brands to request more information about founding partners. Support brands that celebrate our First Nations people who provide platforms for their work, culture and ancestral traditions and beliefs. Support black and brown founders so that marginalised groups of Women are part of the conversation both in front of the camera and behind the scenes. Representation is not only relevant when it comes to the conversation of who appears in media, on our runways and in our campaigns, but also with regard to cultural context and how the representation of the traditional skills, techniques, symbols of artisans and ways of traditional dress are being portrayed in the conversation of fashion. It’s not uncommon that cultural appropriation for design inspiration in the Western context be exploited. We see this happen in editorials when white models for eg: wear a Native American headdress in the name of fashion. Fashion has been using references from other cultures for years without there being any kind of disruption to how the West borrow and steal ideas for profit and pertinence. However if the West were truly inspired by these cultures, they’d learn and attempt to adopt their ancestral ways of living. If this were the case our over consumption issue wouldn’t be an issue we’re facing right now. True sustainability, both as a living philosophy and fashion outlook would be to support, embrace and uplift our artisans and their original creations rather than taking them, monetising them, turning them into designs and mass producing them. So in the context of fashion, representation is key. Fashion informs us on what is happening socially, culturally and politically and the more voices we have apart of this conversation the greater appreciation, respect and acknowledgment we will have for our world at large. Don’t underestimate the power fashion has to communicate messages – at the end of the day we all wear clothes and what we choose to wear says a lot about who we and what we stand for. Use the power of dress and personal style to communicate your value and vote for what kind of world you want to live in. We can all be activists within our individual communities and change starts with you. As an independently run platform, free of advertising and sponsorship, we'd hugely appreciate and wholeheartedly accept any contribution - small or large - as a token for the work we continue to do in the fields of sustainability, second hand & ethical fashion, creative consciousness, female identity/representation and community. All funds will be invested back into the tommie platform to continue to grow and make this the best community site for you to learn and share the wisdom and teachings discovered, with generations to come - as we believe this is how we will affect positive change for a fairer, safer, cleaner and more just home for people, the planet and our animal friends. At present the tommie platform is independently run by founder, editor & eco stylist - Natalie Shehata, who also works full time in the ethical and sustainable fashion space. As a true entrepreneur, ideas generator, conscious activist and slow style story teller, she works around the clock to ensure quality content is delivered to readers, whilst juggling an ethical day job. We want to be completely transparent on this platform, as honesty and integrity are of utmost importance to us; not only in the fashion space, but in all facets of life. So, in order for us to grow and for this site to be sustainable we need financial aid to reach the goals we have set out for you as our community, our readers and fellow 'creative women with a conscience'. These are some of the things your investment will contribute to and what happens behind the scenes to keep our platform not only running, but thriving! It takes great time and length to; research the latest change-makers & innovators, conduct in person and over the phone interviews, transcribe conversations, source second hand outfits for the tommie shop, source photo-shoot locations, edit photos, upload images, write copy, manage social media content, email and liaise, host events, design and manage website, pack orders, measure clothes, write style descriptions and copy - this is just a small intro. These donations will help us to continue to do research and also allow the team to grow and provide other 'creative women with a conscience' paid work. We have been inundated with requests by other women wanting to become apart of the tommie team, but as we'd like to keep this site ad free, we don't have the financial means at present to offer paid work. We don't believe in unpaid positions and want to shift the culture in the creative atmosphere so that all individuals are acknowledged for their efforts, skill and expertise. We're asking for *your* help so we can keep the site ad free, so you're not bombarded or overwhelmed with product pop ups, affiliate advertising and sponsored posts. We want to choose our content, build this with a grass roots approach and stay true to our mission and philosophy to serve you. Your donation will contribute to helping us move from infancy to tackle new and exciting ideas we're itching to work on - and will help provide casual and full time jobs for talented writers, eco stylists', activists, sustainability leaders, photographers, illustrators, graphic designers and everything in between. Thank you more than anything for stopping by - we hope we have inspired or educated you to lead a life of care and thoughtfulness for yourself, one another, the land and our animals.